I know what you might be thinking today. “Jonathan, didn’t you already review this album like two months ago?” Well, yes…yes I did. In truth, I had originally planned to hold off on reviewing “A Very She & Him Christmas” until this December review series, but when I first heard the album, I couldn’t help myself. It made me want to write, and I wound up staying up until one in the morning (on a day when I had to wake up at seven) to finish the review. Ultimately, though, I decided I still wanted to discuss this album during this series, because the theme this year revolves around all my favorite Christmas-themed media, and “A Very She & Him Christmas” is the best Christmas album I’ve ever heard, hands down. In short, I don’t think Zooey Deschanel (She) and M. Ward (Him) have a lot of competition out there for the title of “best Christmas album.” That shouldn’t take anything away from the excellence of this record, though, because what Deschanel and Ward have accomplished here is absolutely remarkable, the new standard by which all future Christmas albums – and individual recordings, for that matter – should be judged. In fact, it’s surprising how many songs there are here that I usually can’t stand. “I’ll Be Home for Christmas” is a well-written piece almost exclusively performed blandly, yet Deschanel and Ward breathe new life into it, providing the verve and character the song needs to soar. “Blue Christmas” is so often unbearably melodramatic, but Deschanel’s performance is a gorgeous vocal showcase that blows nearly every other incarnation of this song out of the water, bringing the heartbreaking emotions of the lyrics out in full force. The phenomenon continues right on to the last track, where She & Him do the impossible by making the woefully overplayed “Christmas Song” sound new again. It’s not just the best Christmas album I’ve ever heard by a wide margin, but also a valuable entry in the She & Him canon, a strong next step for the duo that demonstrates their remarkable talents as music’s most relentlessly pleasant performers. 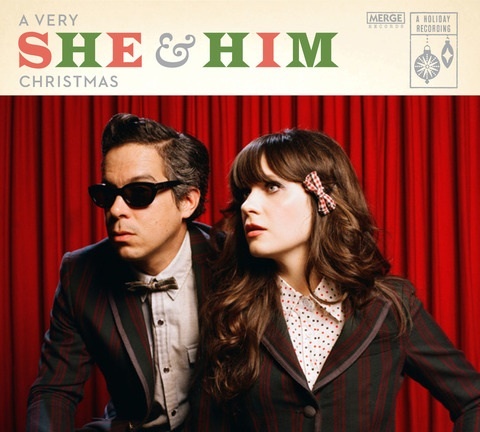 I can’t wait for new original material, but for the time being, “A Very She & Him Christmas” has earned its place as essential, annual December listening.